Liz Kovarsky teaches Sea Change Yoga trauma-informed classes to parents of special needs children who receive support at Woodford's Family Services. She will also soon begin teaching a new series for youth receiving treatment for drug and alcohol use at Day One. 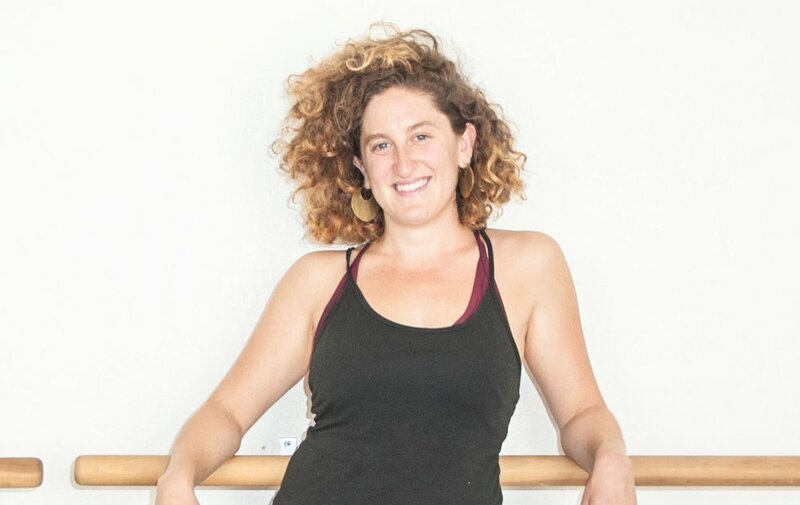 Liz has been teaching yoga in community spaces and yoga studios since 2011. She completed her 200 hour RYT at Prana Power Yoga, in Cambridge, MA in 2011. She has additional training in Yoga Support for Addiction Recovery, Trauma Informed Yoga and Thai Yoga Massage. In addition to her Sea Change Yoga classes at Woodford's and Day One, she also teaches yoga at Hustle & Flow. How would you define yoga if you had to explain it to someone who had never practiced before? What I tell my friends who haven't tried yoga? Yoga is a practice that takes you through a set of physical postures. In the beginning, it feels like great exercise, but over time turns into a much deeper way to connect to yourself and your surroundings. You learn to breathe, even when it's challenging. You learn the practice of noticing the way you think and interact with the world. What did you think yoga was before you started to practice and how has your view of yoga changed? When I started practicing yoga, I liked the exercise element. I liked watching my body grow stronger and more flexible. Now I see that yoga has become a tool to keep me calm in challenging situations and to remind me to make thoughtful choices instead of becoming reactive. How do you see your practice show up in everyday life? When hard things happen in life, from everyday stressors to major life shifts- I find myself using yogic breath to slow down, or I head straight to a yoga class when I need community. I've learned how to come back to myself over and over again this way. How did you come to teach and what prompted you to move from student to teacher? Initially, I attended a yoga teacher training because I wanted a deeper understanding of the physical yoga postures. I was also beginning to notice that I actually liked myself better after I had practiced. After I completed my training, I began going to classes at a donation based studio, where I saw people who couldn't financially afford yoga classes (including myself). This population was the first diverse group I had ever experienced in this context; elderly folks, young students, homeless people, people in recovery. This was the first time that I realized that this practice was therapeutic for me. I figured that if this practice has been so powerful for me, then it probably could be for other people too. That's when I began to teach. How has teaching affected your life and how do you feel when you teach? Consistently showing up to teach yoga has created a whole new level of self-awareness for me. When I arrive to class I am forced to take stock of my own thoughts, feelings and energy level. The best yoga classes are taught when I don't try and change my current state, but work with what's happening in that present moment. When I teach, I am the most present in my thoughts and in my body. There really isn't any space for other thoughts to enter my mind. I feel most connected to myself and to my students in those moments. All of the lessons that I've learned on my mat seem to slowly translate to my life off of that mat, and for that I am grateful. What brought you to Sea Change Yoga? I was having a conversation with one of my previous yoga students when Sea Change Yoga came up. We were chatting about the fact that there isn't a donation based yoga studio in Portland, and how we want to bring yoga to a more diverse population somehow. She recommended that I attend a Sea Change Yoga meeting. Luckily, that moment led me to a whole new world of wonderful people and opportunities. I love that Sea Change Yoga brings yoga to those who wouldn't normally have access to it. What is your “yoga dream”? My "yoga dream" is to run a yoga studio / multi-modal therapeutic space in Portland, Maine, where everyone has access to the care they need. I believe that yoga can be therapeutic for many different people and that it shouldn't be an elitist activity. Everyone deserves to be happy and healthy.